When it comes to retail, workers want to create a top-quality experience for shoppers. Whether that’s helping to keep them safe or continuously restocking inventory, it’s important to have your entire operations completed seamlessly. Our team at Radio Communications of Virginia wants to help with this. That’s why we provide lots of reliable and easy-to-use two-way radios from Motorola. Keep reading to see how they can benefit your retail business, and feel free to contact us if you have any questions. On a day-to-day basis, retail operations revolve around providing the best experience possible for consumers. This includes immediately responding to customers’ needs and addressing any problems as they occur. But it’s also important to have a well-informed and -coordinated staff, to help keep everything streamlined. By improving communications between store managers and associates, you can create a real-time flow of information, while also turning shoppers into loyal customers. One of the most reliable and cost-effective ways that you can manage your retail operations is through the use of Motorola two-way radios. They let you communicate with all your staff members while on the move. This is so you can put the majority of your focus on the customers, where it belongs. While there are many benefits to using two-way radios, one of the biggest ones is instant, real-time communication. In an intense situation, like a holiday rush, you can stay calm knowing you and your employees will be in constant contact with each other. Then, with this type of communication, your team can maintain customer satisfaction to its highest possible levels. Motorola radio service is also great for keeping in touch with warehouses to make sure there are no disruptions in distribution. You can communicate clearly to the warehouse, from the line to the loading dock, to ensure that every product needed for your business gets delivered as quickly as possible. 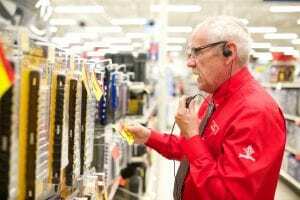 Whether you need two-way radios for staff management, customer safety, or distribution, our team at Radio Communications of Virginia can help. To make sure that your retail operation runs as smoothly as possible, request a quote for Motorola radio service products today!